The forth arson attack at Danelaw Viking Village. In the early hours of 26th January 2003 an attempt was made to destroy the Viking education site at Murton park. 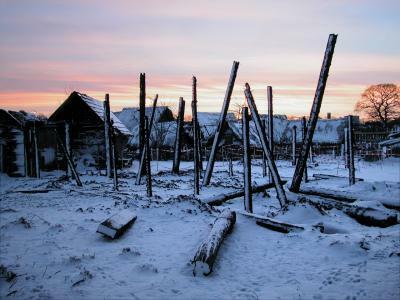 Two days after the fire which claimed three buildings, including the main longhouse this was the scene that faced the reconstruction team. The education work of the site had to be continued while rebuilding commenced. In fact due to the commitment of the education team not one booking was lost despite snow, rain and hard frosts. The clearance of the site began within hours of the fire and re-roofing the least damaged building the next day. Friends of the site and volunteers turned out in strength, all gave time and many donated money to help the reconstruction. 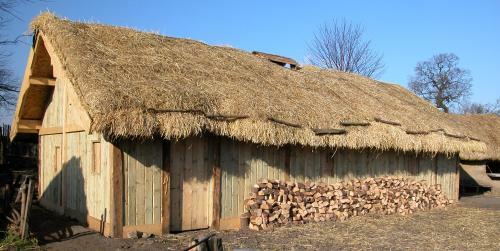 The priority was to rebuild the longhouse, a central element in the children’s education visits. £4000 worth of timber was ordered and every spare hand worked for every spare moment to not only replace the building but make it better than before. As news of the fire spread on the internet some self professed “experts” said that a longhouse could not possibly be built in a short time for such a small sum. If that is the case then the photographs below testify to the Danelaw team’s ability to perform miracles on a daily basis. The building on the right is the result of just five weeks work, without the aid of heavy machinery. Work continues on refurnishing the house and one more building is still being rebuilt. 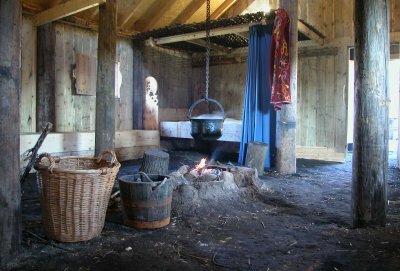 Danelaw Viking Village and Brigantium Roman Fort at Murton Park work with about 60,000 children annually and receive no external funding of any sort. Arson attacks like these will not stop that work continuing but they do slow down other projects at the site. The Tudor Farmhouse which was under development before the fire was delayed but still opened for it’s first school group later that same year.